The party season is well and truly in full swing, weekends filled with staff Christmas parties, school reunions and the annual family gathering. 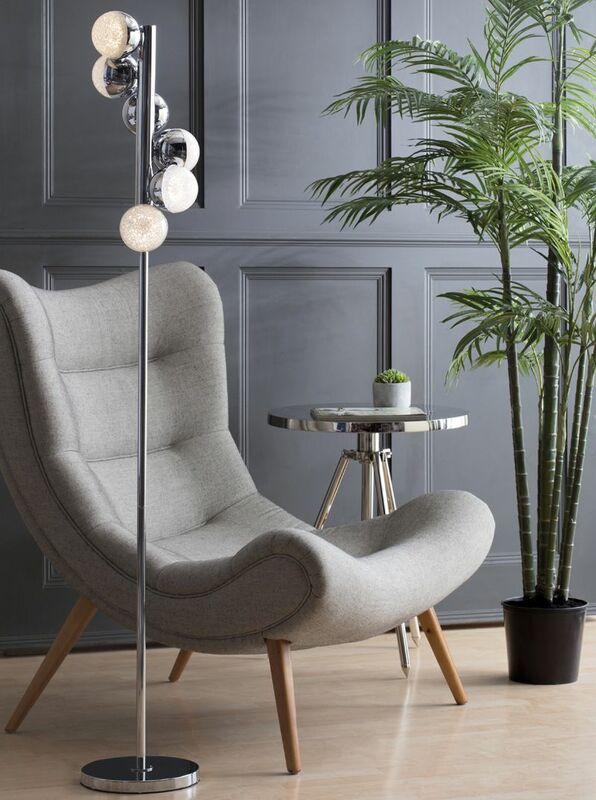 So what better time to introduce out latest lighting range. Our new Corona Collection in Chrome and Copper hits our shops this week. 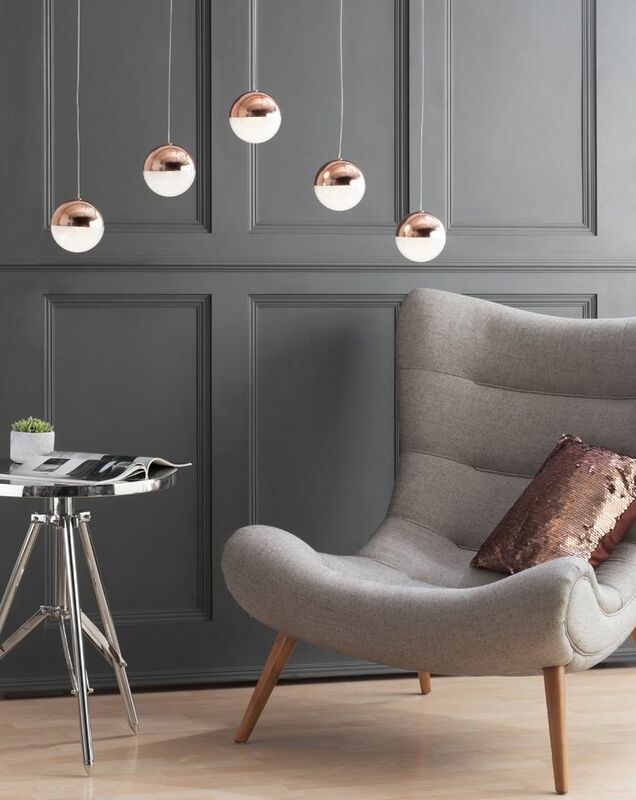 This stunning collection is the perfect addition to any classy and sophisticated interior ad boasting a selection of styles such as single pendants, cluster fittings and bar pendants you’ll be sure to find the perfect fitting to suit your space. The main feature of this stunning range is an embellished globe design. The globe structure is split into two halves, one half showcases a smooth metallic finish of either chrome or copper. The other half of the glass globe dazzles with a dusting of crushed crystals imitating a snow globe vibe. When lit the crushed crystal dusting inside the glass creates a sparkling display that twinkles like snow. 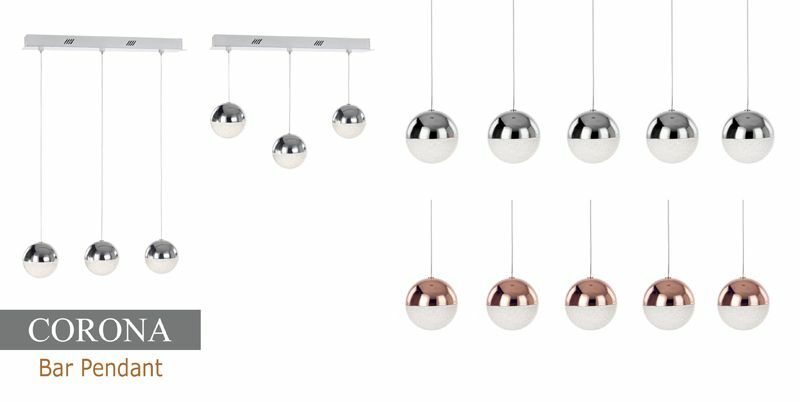 You’re in for a treat with this collection especially the ceiling fittings which come in 8 different designs and sizes. 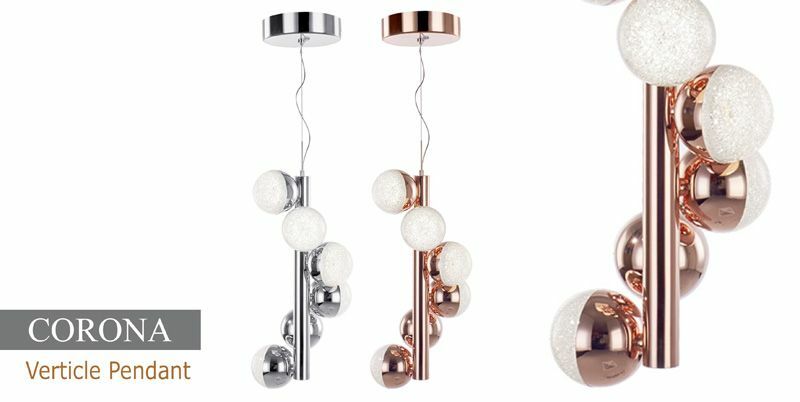 Our cluster, bar and single pendant options can also be adjusted to suit your personal surroundings. Complimenting floor, wall and table lamps complete this range making it the ideal lighting solution for a whole room makeover. 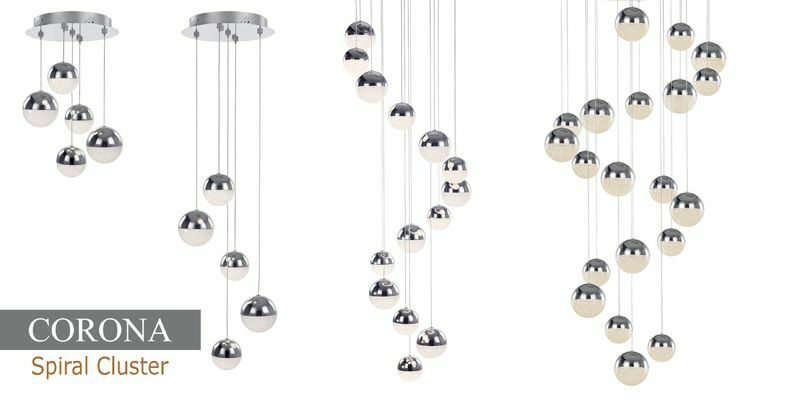 The spiral cluster option is a captivating piece, ideal for high ceilings, hallways and high stairwells. Choose from a modest 5 light, a substantial 14 light cluster or our 20 light masterpiece. Suspend our bar option over your dining table or breakfast bar, this style comes in two sizes, a 3 light or 5 light design, lower or raise each cable to create your own personal design that will fit in your specific interior space. 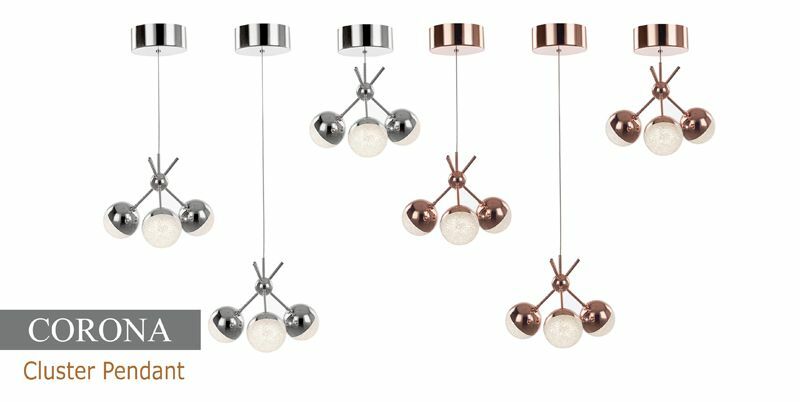 Alternatively choose our single pendant for a more defined finish, you could double these up over a kitchen island. Vestibules and porches will benefit from our slim line vertical style, a tight cluster of glass globes entwines a solid central structure. Each ceiling fitting is suspended from sturdy wires that give the illusion the fitting is floating mid-air. 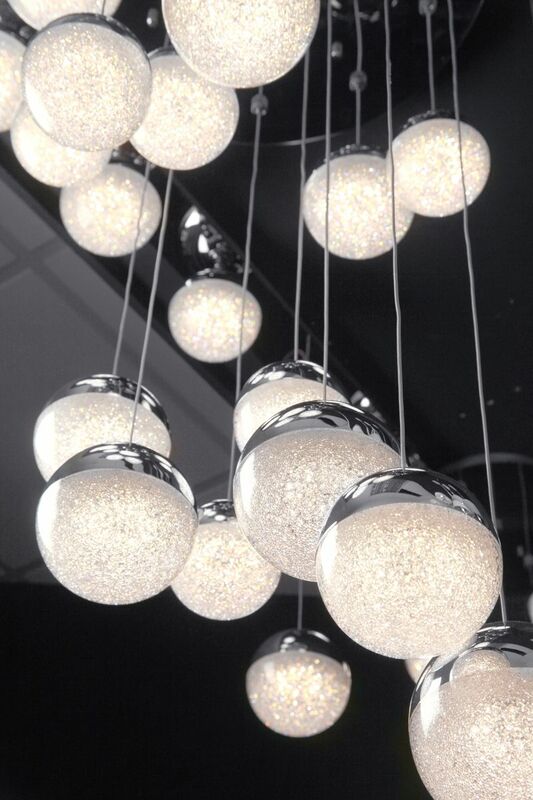 For a more adventurous and daring design we’ve got the 3 light cluster pendant. A funky crossover structure that includes a tripod style design. 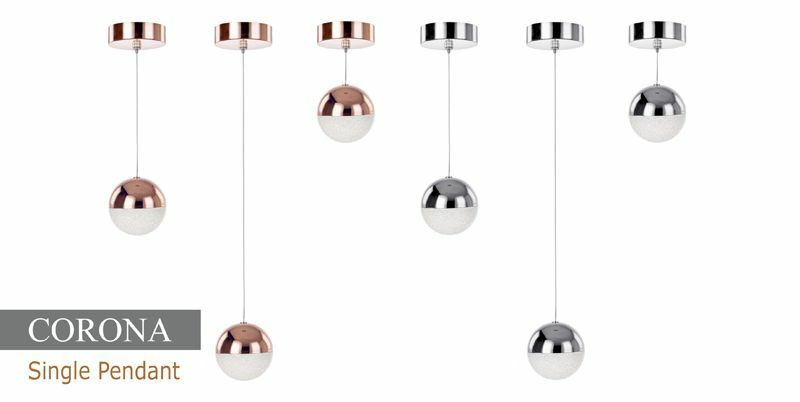 Each ceiling option can be adjusted from a tall pendant to a flush fitting which gives you the freedom to add a personal touch. Don’t forget our accent lighting, create visual interest to your room with some much needed accent lighting. Adding pools of light to specific areas will create a warm and inviting ambience as well as accentuating certain features such as photo-frames, vases and other displays. Our Corona collection offers a complimenting table, floor and wall light design to finish off the range. 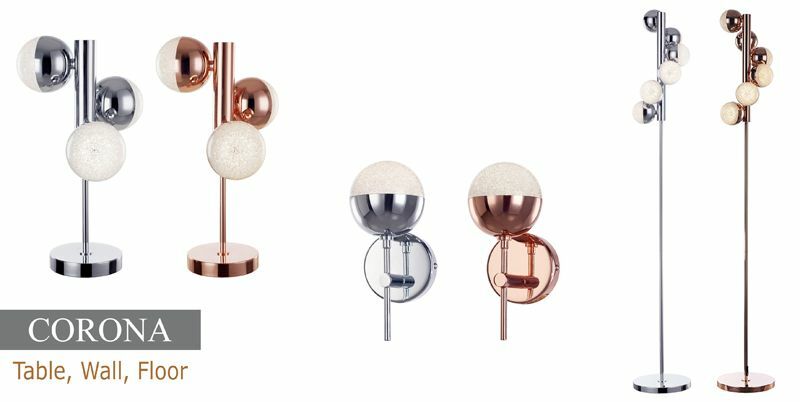 The table and floor standard offers a slim line cluster of globe glass balls whilst our wall fitting boasts a simple one light feature. 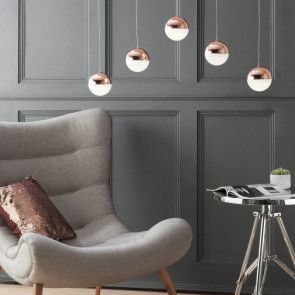 Treat your home this Christmas with this super sophisticated lighting range.